The Russian Soyuz TMA-19M spacecraft carrying NASA astronaut Tim Kopra, British astronaut Tim Peake and Russian cosmonaut Yuri Malenchenko is seen on docking approach to the International Space Station on Dec. 15, 2015. A Soyuz space capsule carrying travelers from Russia, the United States and United Kingdom arrived at the International Space Station today (Dec. 15), with its cosmonaut commander manually docking the spacecraft after its autopilot unexpectedly aborted an initial attempt. Veteran cosmonaut and Soyuz commander Yuri Malenchenko docked the Soyuz TMA-19M with the space station at 12:33 p.m. EST (1733 EST) as both spacecraft sailed 252 miles (406 kilometers) above India, NASA officials said. The Soyuz, which also carried NASA astronaut Tim Kopra and U.K. Space Agency's Tim Peake, launched to the space station early this morning from the Baikonur Cosmodrome in Kazakhstan and reached the station after a 6-hour journey. 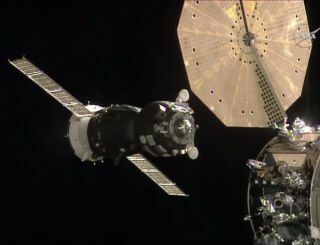 Malenchenko took manual control of the Soyuz after the ship's automatic Kurs rendezvous system unexpectedly aborted the first docking attempt, for reasons still unknown, NASA officials said. The craft reached within 65 feet (20 meters) of the space station before swiftly reversing course. After the switch to manual, Malenchenko backed further away from the station, tested the vehicle's controls and deftly piloted the Soyuz to its docking port over the course of just 11 minutes with the help of the Russian Mission Control in Moscow. At 2:25 p.m. EST (1925 GMT) today, the hatches were due to be opened between the Soyuz and the Russian segment of the space station. Once that occurs, the three will be greeted by NASA astronaut Scott Kelly and cosmonauts Mikhail Kornienko and Sergey Volkov. Russia's Soyuz spacecraft can fly autonomously, through programs activated by the mission crew and ground control team, but manual control capabilities are included in case of any difficulty. "A manual docking is something that Soyuz crews do train extensively for," NASA spokesman Dan Huot said during live commentary of the docking. Malenchenko was particularly up to the task: He is a veteran of six space missions, both to the International Space Station and Russia's Mir space station, and he has commanded the Soyuz during launch multiple times. Today's launch is particularly significant because it is carrying Peake, the first-ever British astronaut to visit the International Space Station. He and the other two new crewmembers will stay on board for six months working on the orbiting lab's many experiments before returning to Earth in June on the same Soyuz spacecraft.